NOW Foods Vitamin B-50 Capsules are a blend of key B vitamins combined with other nutritional factors for enhanced synergism. 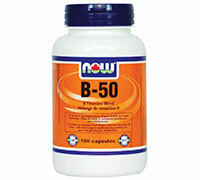 NOW Foods Vitamin B-50 formula provides recommended potencies of the most important B vitamins and is designed to supply your body's required daily intake in one complete supplement. Why do some B vitamin supplements from NOWÂ® have an odor? Is this normal? B vitamins by nature do not have a pleasant aroma. This is normal and does not indicate the product is expired or otherwise compromised. The expiration date of any NOW supplement is printed on the bottom of the bottle. Sometimes you may get B vitamin powder residue on the capsules, usually yellow in color. Again, this is a normal occurrence. There is often a small amount of powder that escapes during the encapsulation process, and it sometimes coats the outside of the capsules. I noticed that your Coenzyme B-complex is enteric coated. Does this mean it's considered slow release? The enteric coating does slow the release of the nutrients somewhat by allowing them to pass through the stomach intact but no this does not create a time release product. It is tested to readily disintegrate in simulated intestinal conditions. Why is the methylcobalamin form of Vitamin B-12 found in your Brain B-12 and other products a better form overall than regular B-12? Also, is it safe and where does it come from? Most B vitamins function in the body only in their coenzyme (or active) forms, and the regular forms as found in our B-12 or certain B-complex products have to be converted into the coenzyme forms before they can do their job. These coenzyme forms, though, are usually much more expensive and are considered more potent than standard vitamin forms. Methylcobalamin is one of these coenzyme forms. It is derived via microbial fermentation, and since it is water soluble has a large safety margin.